"Sampath Speaking" - the thoughts of an Insurer from Thiruvallikkeni: Indian elections : from ballot paper to EVM - I have cast my vote - Have you ? Indian elections : from ballot paper to EVM - I have cast my vote - Have you ? North Paravur, formerly known as Parur is a town, municipality formed in 1912 Ernakulam district of Kerala. It is an old and growing municipality.Paravur is the capital of Paravur Taluk in Ernakulam district. It was here that EVM debuted in India. My favourite write Srirangam Rangarajan (Sujatha) was involved in the design and its usage. Middle aged amongst us would remember that it was all paper elections in our country. It was ballots. A ballot is a device used to cast votes in an election. In British English, this is usually called a "ballot paper". In the traditional Ballot Paper voting system, the votes were cast by the means of the papers in which the voter used to vote by marking the ballot paper with a rubber stamp. Since 1998, the Commission has increased the usage of the Electronic Voting Machine system instead of Ballot Boxes. Those days, the voter on entering the Polling booth would be given a ballot paper. The elector would use a rubber stamp and cast his vote in the allotted box near the symbol of the candidate. The ballot paper would be folded and inserted into a ballot box, which would be sealed at the end of elections and taken to Counting centres. At times there were complaints of snatching of ballot papers, mass rigging, and casting bogus votes by groups of persons. Life has changed since. The 61st Constitutional Amendment Act of 1988 reduced the voting age from 21 to 18 years for the Lok Sabha as well as Assembly elections, providing youth the opportunity to elect the rulers. Be it the ballot or EVM, the name of Candidates are in English alphabetical order – to outsmart their rivals, candidates would have their names changed to be first in the list. For example Hande, would gazette as Ande, so that the name would appear first in the list. Even after 6 decades of Independence, it is the symbols that make people identify their candidates / parties than names. To reach to illiterate masses, each party spends a lot ensuring that the voters identify their parties easily. The Election Commission, thus, has the laborious task of allocating separate election symbols for each party and the innumerable independent candidates. The registered parties have their symbols registered ensuring that none other could use it, while there are free symbols made available for the rest. The free symbols presently are slightly more than 100 for TN elections ranging from Coconut, cot, cube, door bell, envelope, flute, gas stove, glass tumbler, grapes, green chillies, harmonium, helmet, hockey bat …. Earlier days, to cause confusion there would be candidates having the same name contesting. Political parties smelt some trouble arising out of this. Now the EC has put in place, classification into 3 categories for the purpose of listing of names: Candidates of recognised political parties, candidates of registered-unrecognised political parties; other (independent) candidates. The alphabetical arrangement is done category-wise. Recalling my memory, the ballot paper could accommodate 16 candidates – when more contested, the no. of papers increased – so 4 papers could accommodate 64 – but there would whole lot of confusion and waste of time. 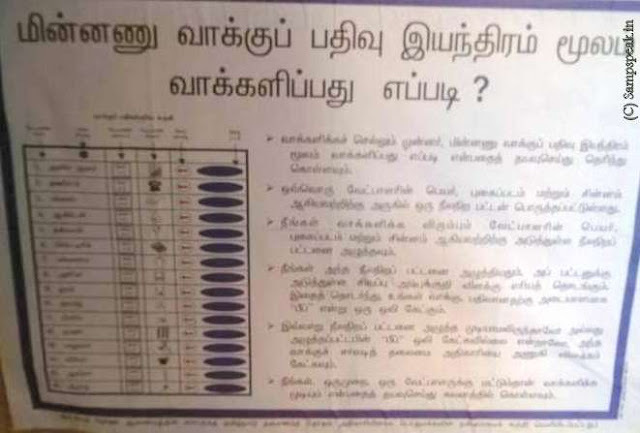 Remember that in one election in Madurantakam more than 64 contested just to put pressure on polling process. Modakurichi, in Erode were to top that all. In 1996 Assembly elections, a record no. 1033 candidates contested ! If it were to be printed papers, it would be more of scanning a booklet. In Nalgonda Lok Sabha elections in 1996 there were 480 of them, followed by Belgaum in Karnataka with 456. At Modakurichi, elections had to be postponed by a month since the ballot papers (rather ballot books) were not ready in time. The polling time also had to be increased by two hours. Except three (3), rest of 1030 candidates forfeited their deposit. Understand that 88 of them did not get a single vote [not even that of the candidate !!] and 158 for a single vote, making mockery of the process. Now it is EVMs all the way and in some designated booths there is also the VVPAT - Voter-verified paper audit trail. Voting has begun at 7 am – I have cast my vote already. In EVM, it is simple, – on the box, the Name, symbol are listed – the voter should press the blue button for a short while, once recorded a beep sound could be heard, that confirms the registration of the vote in favour of candidate / symbol. Happy Voting and we will wait for the results on 19th May 2016.